Hello, everybody. I have been teaching English since 1994. I usually teach kids from 2 to 10, teens and adults. I really like to share my ws with u. 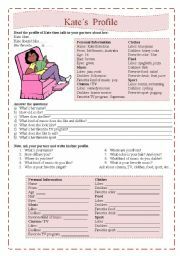 This ESLPRINTABLES family is amazing. Thank you all. 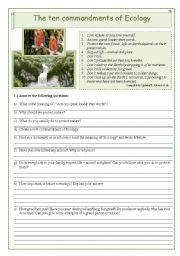 The ten commandments of ECOLOGY - 5 pages - with answers and a project suggestion. I WON A PRIZE with this ws. A very good exercise for recognising people. The stds need to find the two thieves and then answer some questions about age, place, quantity, descriptions. 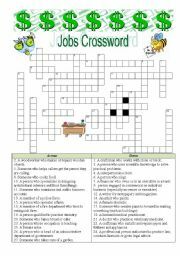 A nice crossword with jobs definitions. Answers are provided. If you like crafts, you´ll love this one. It´s a heart box. 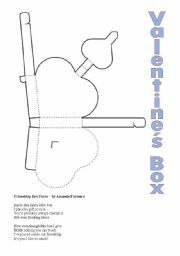 The stds should color, cut, prepare the box and after write the poem inside the box. 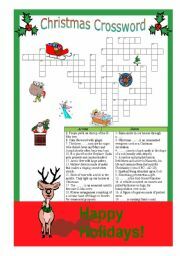 It´s a very goo present for friends, parents and lovers. My second power point game. Thanx again to Gabitza and Marilove for the help. I tried really hard to compress it, but it wasn´t possible so I had to split it. 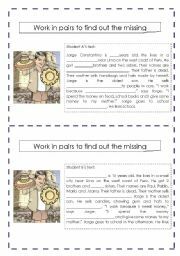 The stds will listen to the words and analyse the family tree and click on the correct word to complete the sentence. Hope you like it. This is part 3. 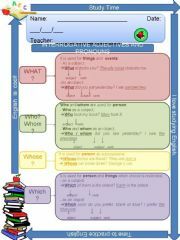 The stds will listen to the words and analyse the family tree and click on the correct word to complete the sentence. Hope you like it. I took the pics from a book. I hope everybody likes it. This is the first set and has 08 slangs and 16 pages. The second set has 09 slangs and 18 pages. I took the pics from a book. I hope everybody likes it. This is the second set and has 09 slangs and 18 pages. The first set has 08 slangs and 16 pages. Talking about my friend´s routine and free time. I chose the pics carefully. I hope everybody likes this.